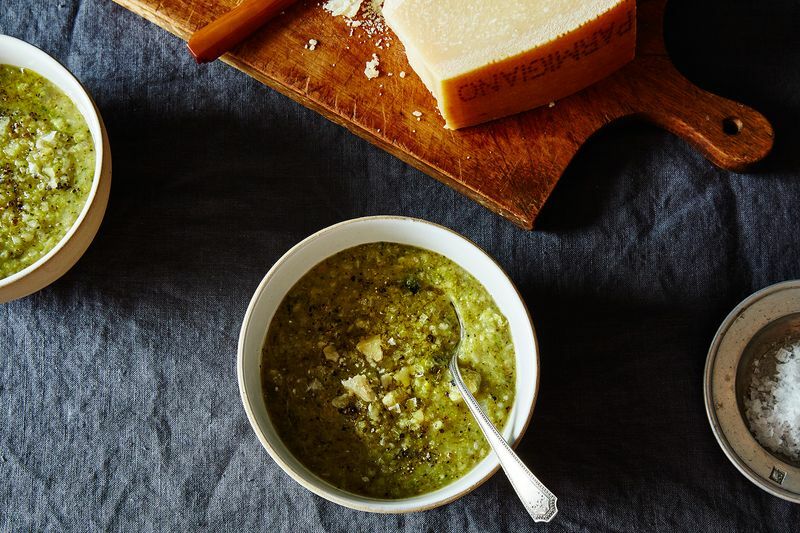 This soup isn't cream of broccoli, but that's only a technicality. It has no cream, and could easily have no dairy at all. 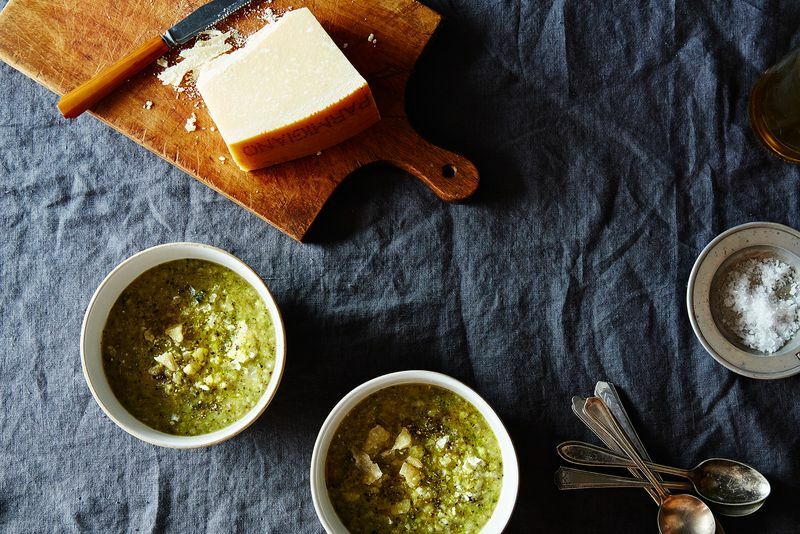 You won't even need a richly flavored stock—you can start truly from scratch, with just a few vegetables, olive oil, and water. Yes, water. 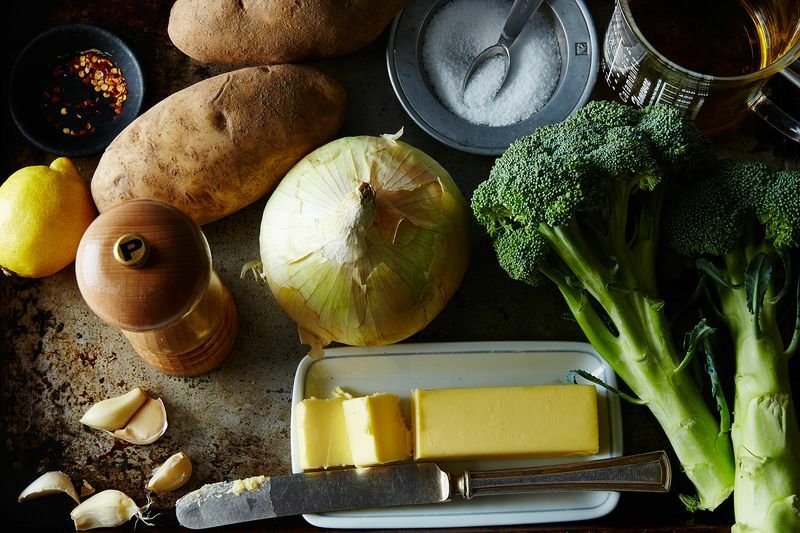 And yet, it has everything the best cream of broccoli should—the comforting heft, the savory, buttery padding for all those soft, grassy bits of stem and floret—and even more of it. This also means that everyone can have a better, richer, more flavorful broccoli soup: the vegetarians (and, with some light adaptations, the vegans), the dairy- and gluten-averse, the broccoli lovers, and the ones who claim to hate it but maybe sometimes order the cheesy broccoli soup because it comes in a cool bread bowl. So you can have all your friends and family over for dinner, no matter their allergies or feelings, and everyone will be happy. Except for the person who doesn't like soup. I'm kidding! That person doesn't exist. To get this much flavor out of very little, we need to follow writer Melissa Clark and chef Andrew Feinberg's lead. Clark developed this recipe for her Good Appetite column at the New York Times, inspired by a technique she picked up from Feinberg. 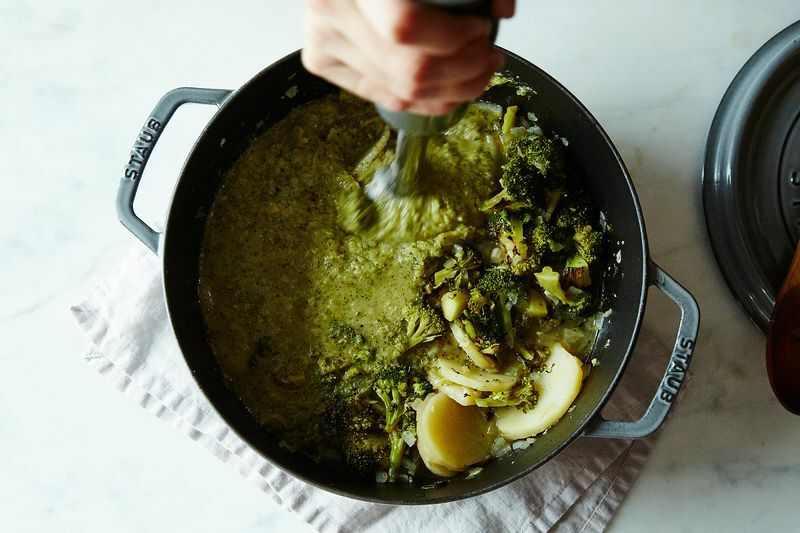 He likes to get a deep, even sear in a generous amount of olive oil, but only on one side, leaving the other side barely cooked (a trick he also uses on the broccoli in his genius slow-baked frittata). If you have a powerful broiler, you can be even lazier in applying the half-seared principle. "Instead of searing in the soup pot, I broil," Clark told me of her recent adaptations of the technique. "You can do a whole pan at once in under 5 minutes. Same principle, just brown one side without cooking the whole vegetable." Why only half-do the job? If you were to brown all the broccoli on both sides, the soup would be rich and smoky, maybe leaning a little bitter. 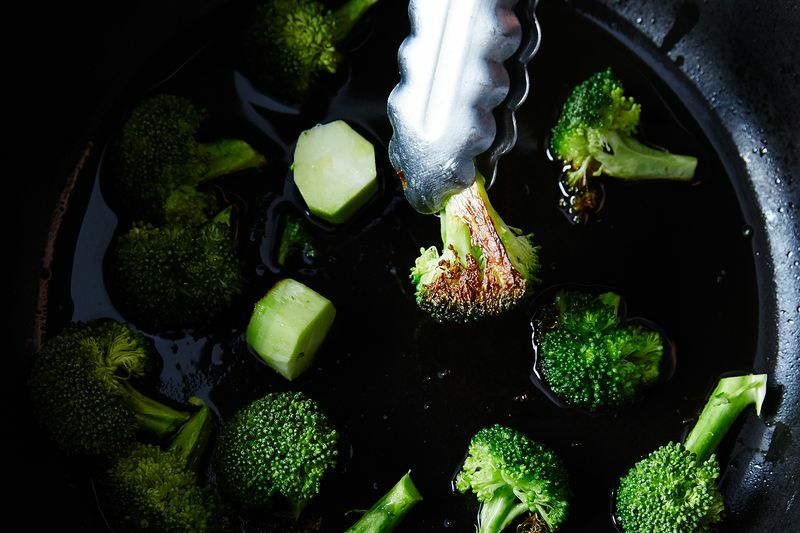 If, instead, you were to leave it largely unadulterated and keep the broccoli from browning, it would stay fresh and green-tasting. "In warmer times, I like to sweat the broccoli, which provides a cleaner, greener, and altogether lighter broccoli flavor," Feinberg told me. 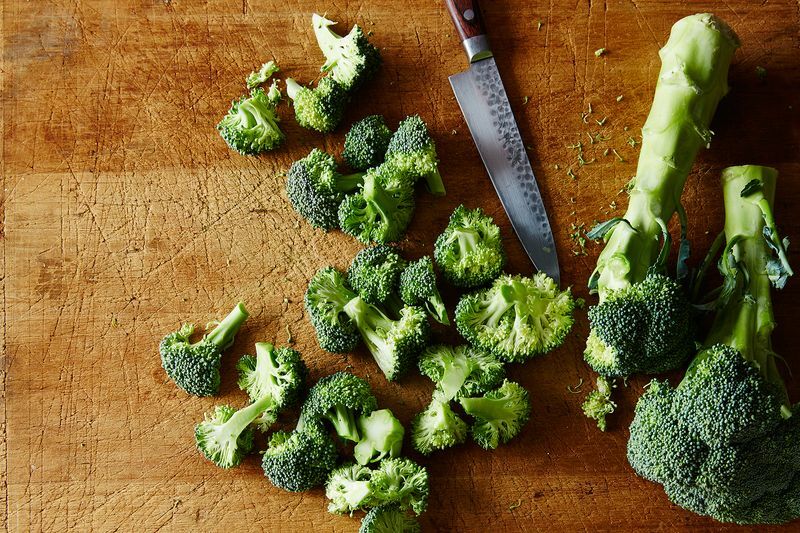 "If it's chilly outside I want deep, rich flavors, so browning the broccoli makes sense." Both of these extremes can be delicious, if you fiddle with the salt and texture and acid until you like it. But by combining the two, you get the best of all possible worlds, the Goldilocks-level attention to detail that gives you a soup with depth and complexity well beyond its humble ingredient list. Every register of the spectrum of broccoli presents itself like little von Trapp children—each bite is at first bright, then downshifts to umami, then caramel. This technique also works well with zucchini and butternut squash, according to Clark, and I could see it doing great things for other timid vegetables like carrots, cauliflower, or potatoes. In every case, the full range of their powers are just waiting to be unlocked, and for once, adding cream will be the last thing you'd think to do. Every week, Food52's Creative Director Kristen Miglore is unearthing recipes that are nothing short of genius. Got one for her—from a classic cookbook, an online source, or anywhere, really? Please send it her way (and tell her what's so smart about it) at [email protected]. Thank you to Sarah Milstein for this one! I cut the salt, added in some nutritional yeast and used sweet potatoes instead (it's all I had). I love it. Tastes rich and flavorful without the guilt. Too much salt, and a whopping 1/2 cup of olive oil. I'd rather use half a cup of cream, or, lower the olive oil to a couple of tablespoons. I made this tonight and I'm thinking that roasting the broccoli in the oven on a baking sheet would be a lot easier if I make it again. My family liked it "okay". It was good and I'm happy to be able to make this without dairy, but it's not really impressive. Maybe I'm just not a broccoli soup lover, period. Not unlike Marian Morash's reicpe from the Victory Garden Cookbook (1982) except hers has garlic - more yum!